When Jamie posted a picture of this awning, it reminded me of two things. 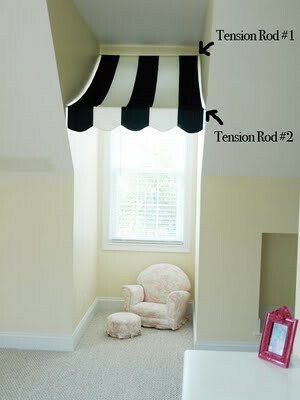 #1 - I saw a fantastic indoor awning DIY on Pinterest a while back...it's completely adorable and very doable. Both of our upstairs bedrooms have alcoves that may need this decorative treatment ASAP. #2 - Carter and I are about 90% sure we are going to opt for an awning on our front stoop when we tackle the house's exterior this spring. We both love the look of an old-school awning and our stoop is a bit exposed when it's raining and such. We think it will also give our plain little house a bit of character once we paint it and spruce up the front yard. Love the "Dickerson" -- seems like the best of all worlds in terms of masculine/feminine, structured/detailed, etc. Fun! Thank you for this tip! 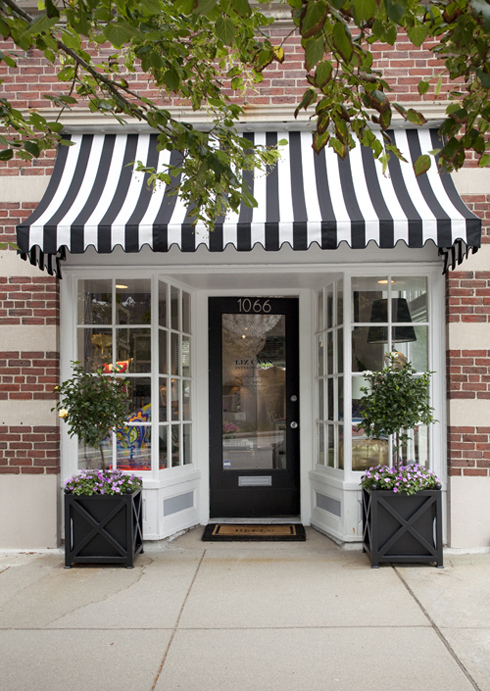 We hope to paint our brick home soon and I have been wanting an old style fabric awning such as this as a less expensive alternative to building columns, etc. Thanks! Daniella I love love the storefront. So inviting. Then your idea of doing the indoor awnings for the alcove windows is perfect!! i do awnings INSIDE every chance i get.